Acer’s TravelMate 5000 series are economical notebooks designed for basic users. The large display with elegant graphics is good for web browsing and entertainment. 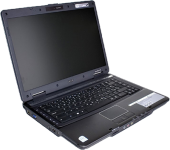 The built-in DVD drive and completes the notebook and eliminates the hassle of carrying additional equipment. Highly portable and flexible, this notebook is perfect for everyday tasks at home or a small business. Upgrade your TravelMate 5000 notebook's memory for added results.